If you are coming to Lisbon, you already know that you will eat wonderfully because the Portuguese cuisine is amazing. But like everything in life, the restaurants of the best Portuguese chefs are a little bit expensive and not accessible to everyone. Taking this into consideration, the supermarket chain El Corte Inglês invited 6 of the most famous Portuguese chefs to create a “street food market” on the 7th floor of Corte Inglês in Lisbon. 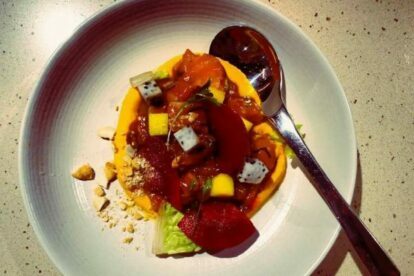 Between those chefs, I tried the new spot of Chef Kiko – “O POKE”. He runs six restaurants all in Lisboa and all of them are mixing different flavours and inspirations — once, Chef Kiko spent a lot of his time travelling through Asia to learn its gastronomy deeply. So I did something that it is very Portuguese: I looked around, saw the dishes and drinks that other customers were having, and just went with the flow. I had: Kalua Pig Mini Sandwich, Tropical salmon Poke and Pure ceviche. To drink, I chose the cocktail ‘Pisco d’A Cevicheria’.